For recreational wreck divers, here are several coastal locations and fresh-water lakes where historic shipwrecks loom beneath the surface and create an interesting underwater experience. From the Great Lakes to Guam and from the East Coast to West Coast, let us be your guide to explore America’s maritime history at these marine sanctuary and national park locations. Check out this map of National Parks Submerged for even more great locations for underwater exploration. Use this diving brochure by the National Marine Sanctuaries for more marine diving options. Remember to take only photos and leave the wreck sites completely intact. These vessels provide a window into our past and are best left undisturbed for everyone to experience. Check with local officials to determine if diving permits are required. About 1,660 square miles (2,672 km) of ocean and near-shore habitat off the southern California coast make up theChannel Islands National Marine Sanctuary. The maritime heritage here is vast with an inventory of more than 140 shipwrecks documented between 1853 and 1980; yet only 20 have been located. Weather conditions can change quickly in this area, a main factor for many of the shipwrecks among the islands. Air and water temperatures that hover about 80 degrees Fahrenheit (27 Celsius) make Guam a popular destination for divers. The War in the Pacific National Historical Parkpreserves this strategically-located island and its importance in U.S. history. The period between the Pearl Harbor attacks in 1941 and subsequent Japanese occupation of Guam, followed by the American reinvasion in 1944 are the primary focus of the park. Many of the wrecks are of Japanese origin. Known as the “Ocean Graveyard,” more than 3,000 shipwrecks have been recorded along Cape Cod’s coastline. While most of the dive sites are outside of the park’s boundaries, Cape Cod National Seashore provides ample opportunity for wreck divers to explore a significant chapter in America’s maritime heritage. “Know before you go” is crucial before embarking on a diving adventure in this area—check local conditions and consult local diving experts. Located north of Cape Cod, Stellwagen Bank is an underwater plateau that spans 19 miles (31 km) north to south, is six miles wide and between 100 to 120 feet (30-37m) below the surface. Stellwagen Bank National Marine Sanctuary protects maritime heritage for several historic and modern sunken vessels. While dive conditions in this offshore environment at the mouth of the Massachusetts Bay can be challenging, it is also rewarding. For more visitor information about Stellwagen Bank National Marine Sanctuary, check out our Spotlight Article. The frigid waters surrounding Isle Royale National Parkhelp preserve 10 major shipwrecks that represent some of the earliest steam navigation dating back to the late 1800s through the 1940s. Located in Lake Superior, Isle Royale is a wilderness area 45 miles (72.4 km) long and two to six miles (9.6 km) wide. The water around the island is clear and the below-50-feet (15.2 m) water temperature is the same year round, two degrees above freezing. On November 23, 1907, after hours of fighting a gale in northwestern Lake Huron, the crew of the wooden steamerMonohansett took a chance to regroup, only to be faced with a fire that quickly sank the ship. All 12 crewmembers made it to safety. Today, the Monohansett's steel propeller and lower hull are visible in 18 feet of crystal clear water. With more than 50 identified shipwrecks ranging from schooners to steamers and from depths shallow to deep, Thunder Bay National Marine Sanctuaryis a recreational wreck diver's dream. Known as the “Graveyard of the Atlantic”, Cape Hatteras National Seashore and the Outer Banks are meccas for wreck divers. Topography, weather and currents made for treacherous sailing conditions and caused many shipwrecks for merchant ships. During World War II the Germans launched an attack sinking more than 80 ships. There are also wreck sites among the sand dunes, and depending on shifting sand, one can observe the skeletons of ships as time and erosion converge to dismantle these vessels. Among 22 islands in Lake Superior is Apostle Islands National Lakeshore where more than 100 shipwrecks create about two dozen known wreck sites; most of which are great for diving. Be aware that the water here is dangerously cold and weather can change quickly. Check the park’s Things to Know Before You Go to help you plan your trip. September is Better Breakfast Month, and that means it’s time to start cooking healthier and more delicious breakfasts on the road. Stop eating your first meal of the day at fast food restaurants and opt for these mouthwatering breakfast recipes instead. Place two bacon pieces on top of a double layer of tin foil. Place a handful of hash browns on the foil, then break an egg on top. Add 1/4 of the tomato and onion on top of the egg. Wrap all of the ingredients tightly in the tin foil, so there are no leaks. Continue the same process with three more packets, then place the packets on a hot grill (or over the campfire). Cook for 20 minutes or until the bacon is cooked all the way through. Remove the packets from the heat, sprinkle shredded cheese on top and close the packets to melt the cheese before serving. Place a piece of ham in six of the cups of a cast iron drop biscuit pan, so each piece forms a small cup. Break an egg into each of the six cups. Place a dollop of creme fraiche on top of each of the uncooked eggs. Bake in your RV oven for 10-20 minutes or until the eggs are cooked to your liking. It’s fall and no matter what the weather, it’s invigorating to be riding on dirt. Enjoy this list of trails for shoulder-season riding to experience cooler temperatures, fewer crowds and scenic vistas that reward the effort. Mountain biking often calls upon core strength, stamina, great balance and bike handling skills. With bikes adapted for rough terrain, the appeal of this off-road sport speaks to many—from novice to expert alike. Who can resist the smooth dirt or rock as you effortlessly glide downhill, or the technical aspects of picking your way through roots and rocks, or the satisfaction of conquering a climb? We think you’ll agree that some of the best mountain biking is on federal lands. Remember, safety first. Check with your local bike shop about bike and helmet rentals and remember to practice safe and responsible riding etiquette. This northern section of the Arizona Trail, a trail that runs over 800 miles (1,287 km) from Mexico to Utah, is located west of Page, Arizona. From the trailhead, mountain bikers are treated to 12.5 miles (20.1 km) of trail south through the steep and rugged eastern flank of Buckskin Mountain. Expect sweeping views of the Vermilion Cliffs, Coyote Buttes, Kaibab Plateau and southern Utah. The Womble Trail stretches over 37 miles (59 km) from Northfork Lake to the Ouachita National Recreation Trail. This trail is considered to be one of the best singletrack trails in this area. Short segments of the trail meander along the bluffs of the Ouachita River, with breathtaking views. Hikers and mountain bikers can combine the Roundtop Trail with the Womble and Ouachita National Recreation Trail (west of Highway 27) to form an eight-mile loop (12 km). The Genoa Peak ride takes you on the Tahoe Rim Trailthat runs along the east shore of Lake Tahoe. Several views of the Carson Valley as well as glimpses of Lake Tahoe can be seen along this forested trail. Along with mountain biking in the area, visitors can camp nearby atNevada Beach Campground or Zephyr Cove Resort and Campground. The mountain bike trails traversing the Santa Monica Mountains weave through diverse terrain. From ridgetops to canyon floors, there are many opportunities for a great ride. Challenge yourself with an exhausting ascent that yields rewarding ocean views, or leisurely pedal along an oak-shaded stream. On any trek, always ride safely and responsibly and with minimal impact to the land. Don’t let the name fool you! Ranked “very difficult,” this is sure to be a leg-burner. The Zippity Do Da trail is a straight forward “out and back” trail, and is part of the bigger North Fruita Desert Trail System—allowing numerous opportunities to extend the length of your ride with several loop options. Stay a few days and explore the area—nearby North Fruita Desert Campground is open from March to November with 35 individual campsites, first-come, first-served. The Munson Hills Off-Road Bike Trail offers a scenic and challenging ride through varied terrain. The original trail has expanded to include the Twilight Loop, for a total of 21 miles (33 km). The old sand dunes of Munson Hills were once Florida’s shoreline, and they now support towering longleaf pines and pristine ponds. The trail dips down through oak hammocks and winds its way through piney flatwoods, providing opportunities to observe songbirds, deer, fox squirrels, frogs, snakes and the gopher tortoise, a protected species whose burrows provide homes to as many as 40 other animals. Members of the local Southeast Off-Road Bicycle Association (SORBA) chapter maintain the trail in cooperation with the U.S. Forest Service. Located on the J. Strom Thurmond Lake north of Augusta, Georgia, the Bartram Trail is a 27-mile (43 km) long trail that starts at West Dam recreation area and follows the shoreline to Keg Creek. Designated a National Recreation Trail, mountain bikers of all levels will find a comfortable distance on this trail while enjoying the local flora including trillium and Georgia asters. Visitors can add a bit more distance by riding the Lake Springs Loop, approximately 3 miles (4 km) through Lake Springs recreation area. Mountain bikers of all levels will enjoy the rolling landscape of this relatively new trail system west of Hailey. From early spring to late fall, riders will find these fast and fun trails a necessary stop when visiting central Idaho. This network of 20 or so trails (PDF) is great for riding—with something for everyone. It’s still under-the-radar, though, so mountain bikers in the know should take advantage of the lack of crowds while they can. Terrain ranges from mild jeep roads to techie singletrack, through sage and cedar. The trails connect with other trails managed by the Bureau of Land Management Pocatello Field Office. Appealing to the entire family, Sugar Bottom Mountain Bike Traillocated at Coralville Lake’s Sugar Bottom Day Use Area, accommodates all types of rider offering well-marked trails indicating the level of difficulty. Through wooded valleys and prairies, mountain bikers can take in the beautiful views of Coralville Lake while riding top-notch singletrack. No need to hurry home, reserve a campsite at Sugar Bottom Campgroundand continue your adventure with nearby Sugar Bottom Disc Golf Course and hiking trails! Located on Perry Lake in northeast Kansas, Skyline Trail (PDF) is part of the Perry State Park trail system. With over 15 miles (24 km) of easy-to-difficult rated riding, these trails will keep you on your toes as you experience Kansas hardwood forest and wooded hillsides. Many of the trails consist of hills, tight turns, off-camber sections, fast lines and technical rocky sections. Skyline Trail is rated easy and totals 3.5 miles (5.6 km)—and that’s just the beginning. Loops off of Skyline are numerous and even the most experienced rider will be challenged in this trail system. Located in the Land Between the Lakes National Recreation Area, the Canal Loop Trail (PDF) includes four connector trails covering 1.5 miles (2.4 km) to 14.2 miles (22.8 km). Popular because of the less strenuous terrain and scenic lake views, riders will still be challenged with the Kentucky Lake portion of the trail including fast singletrack and challenging climbs. Want more? Check out the numerous trails in the area. Winding through the heart of Acadia National Park (PDF), the carriage roads have crushed-rock surfaces perfect for your mountain bike. A gift from John D. Rockefeller Jr. and family beginning in 1913, today’s carriage roads are closed to motor vehicle traffic allowing bicyclists to explore more than 40 miles (64 km) of Acadia’s diverse and beautiful landscape. Shared by hikers and equestrians, please remember, courtesy and safety are a priority. A more primitive trail near the confluence of the Tittabawassee and Shiawassee Rivers in the Shiawassee National Wildlife Refuge, the Woodland Trail will take riders through bottomland hardwood forest and past historic landmarks from early coal mining days. Additional loops include the Marsh and River Loops (PDF). Trail use may be limited due to seasonal flooding and wet conditions. Located in the Bitterroot National Forest south of Missoula, the Railroad Creek Mountain Bike Loop (PDF) is a 19-mile (30 km) intermediate ride on forest roads. Count on about six miles (9 km) of uphill with plenty of scenery and chances to spot local wildlife. Remember, although you are on forest roads, always watch for vehicle traffic. With a name like Bloody Shins Trail, how could we resist! With over 30 miles (48 km) of beginner to advanced trails, the Bloody Shins Trail system (PDF) is accessible from the Water Canyon Recreation Area near Winnemucca, Nevada. Whether you want a loop trail or to add a few side trails to increase your mileage, there is certain to be an adventure waiting with a name like that! Though some trails within the Nantahala National Forest are closed to bikes, the Tsali singletrack trails are nationally known for great mountain biking. Tsali (Sah-lee) Recreation Area’s four-loop system offers a variety of landscapes. You can climb one-foot wide rugged paths or travel flat, wide roads. Tsali’s trails meander through mixed pine and hardwoods on a peninsula stretching into Fontana Lake. The U.S. Army Corps of Engineers and the Brushy Mountain Cyclists Club cooperated to build this fantastic trail system. Their project started at Dark Mountain in November of 2002 with a visit from the International Mountain Bicycling Association’s Trail Care Crew. Over 35 miles (56 km) of purpose-built, sustainable trail have rolled out since then, including the (less difficult) Overmountain Victory Trail and, most recently, Warrior Creek trails. Each area has its own unique qualities. The entire system is within a historic corridor that follows the path of Daniel Boone, the Overmountain Men and plenty of moonshiners. Now a mountain bike mecca, many riders call Bend, Oregon, home. If you’re traveling to central Oregon for vacation, bring your ride and explore the Mrazek Trail. Just outside of Bend, you’ll find the trailhead at the southern edge of Shevlin Park. From there, the trail takes you through varied terrain (PDF) including old-growth hemlock forest in Happy Valley. Loops in the area abound if you’re looking to make a day out of this ride! Popular with mountain bikers and hikers, the McKenzie River National Recreation Trail closely follows the undulating McKenzie River. Log bridges, 600-year-old Douglas fir forests and white water are sure to make your ride memorable. The upper sections of the trail won’t disappoint–waterfalls and lava flows abound. Stay a while; reservations are available for nearby Paradise, Olallie andCold Water Cove campgrounds. Located in the Allegheny Mountains of the Keystone State, the Allegrippis Trail System is considered by many to be one of the best mountain bike trails east of the Mississippi. Specifically designed by mountain bikers for mountain bikers, the trail is also open to any non-motorized use, including hiking. But the 32-mile (52 km) singletrack mountain bike trail system is known mostly for its riding potential. The mostly smooth, flowing surface and more challenging trails provide opportunities for every skill level and the lush, green foliage makes way for some intense colors, come autumn. At approximately 22 miles (35 km), the Northshore Trail at Grapevine Lake will tempt beginners and technical riders alike. With several trailheads for access (PDF), the trail provides one-way loops with the eastern side appealing to beginners and the west calling those looking for varied terrain and a challenge. Kokopelli’s Trail is a 142-mile (228 km) multi-use trail from Loma, Colorado, to Moab, Utah. Most mountain bikers use this trail as a through route. Trail surfaces vary; the trail utilizes dirt roads (of all degrees of difficulty), paved roads and some small portions of narrow track. A multi-day Kokopelli’s Trail outing requires you to plan extensively—so take all the steps to make the most of your Moab mountain bike adventure. It’ll be one you won’t soon forget. The Bureau of Land Management lands in the Uinta Basin of Utah offer excellent mountain biking opportunities for any type of rider, from experienced to novice. Enjoy the miles of unpaved roads or seek out more adventurous routes on the area’s singletrack trails. The opportunities here range from narrow desert trails in the Red Fleet and McCoy Flats areas to the forested and rocky Flume Trail in Dry Fork Canyon, to the technical challenge of the Rojo Trail. *Note: Most of the singletrack in the area was historically—or is currently—active livestock trail. Please respect livestock, range improvements and other trail users. From Abingdon to Whitetop Station, the Virginia Creeper Trail spans just over 34 miles (54 km). This shared-use rail-trail truly has it all—history (Native Americans to rugged railroad), amazing downhill (nearly seven percent grade in some places), visitor centers, and friendly communities along the way—stop for a bite to eat or a cool drink. Partly located in the George Washington Jefferson National Forests, this trail is busy in the summer; follow trail etiquette and everyone is sure to enjoy this adventure. Bike shuttles and rentals are available in nearby communities. The Great River State Trail is a 24-mile (38 km), scenic crushed limestone trail. It is also a piece of the Great Wisconsin Birding and Nature Trail built on an abandoned railroad line. It passes through bottomland forest, sand prairie and riparian habitats in the Upper Mississippi River Valley. The trail offers access to two national wildlife refuges, the town of Onalaska and the city of La Crosse, as well as local parks. History buffs can see Hopewell Native American mounds from a trail observation deck. The Great River State Trail connects to more trails inside Trempealeau National Wildlife Refuge and the bike trail offers wonderful views of Lake Onalaska and the Minnesota Bluffs from the Upper Mississippi River National Wildlife and Fish Refuge. Just as the name implies, this easy 3.5-mile (5.6 km) trail rambles through aspen and sagebrush leading to beautiful views of nearby Jackson. To increase your mileage or add difficulty, try one of the many connector loops off the Putt Putt trail. The Sequence IIIG Engine Test (ASTM D7320) is designed to evaluate automotive motor oils for oil thickening, piston deposits, oil consumption and engine wear during moderately high-speed, high-temperature service. It must be passed for motor oil to meet the API SN and ILSAC GF-5 motor oil specifications. Results in the 100-hour test are an important indicator of how well a motor oil will perform in real-world service. 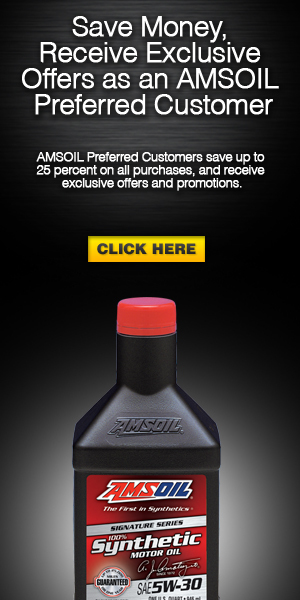 Because Signature Series has historically performed well in the test, AMSOIL decided to push the envelope and subject the oil to a double-length (200-hour) Sequence IIIG Engine Test. Signature Series 5W-30 Synthetic Motor Oil not only passed the double-length test, it did so with flying colors. Results show the oil delivered outstanding wear protection, deposit control and oxidative stability after 200 hours of testing. The complete results are available in the new Sequence IIIG Field Study. Modern engines demand increased performance from motor oil. Turbochargers, direct fuel injection, variable valve timing and other advancements improve fuel economy and performance, but result in increased operating temperatures, pressures and contaminants, while increasing the likelihood of viscosity loss due to mechanical shear. Motor oil today must guard against the negative effects of added stress for today’s sensitive engine systems to function as designed. While not all motor oils may be up to the challenge, these test results prove that Signature Series offers exceptional protection against harmful deposits, viscosity increase and wear in the toughest conditions, helping motorists maximize the performance and longevity of their vehicles. Its ability to keep components clean despite increased stress helps sophisticated engine systems operate smoothly and demonstrate long life. Signature Series’ outstanding performance combined with its extended-drain capabilities offer a unique combination of quality and value not offered by other motor oils.